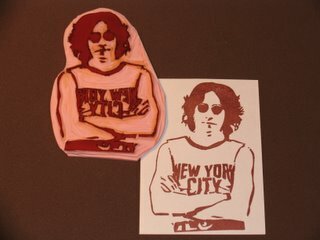 I carved a favorite image of John Lennon...who in my opinion was THE greatest songwriter of my generation. I was 13 when The Beatle's invaded America (as the press put it). I am 55 now and STILL listen to their music daily. I am as blown away today, as I was all those years ago by the haunting lyrics of Lennon & McCartney. To watch some incredible videos of John go to the official John Lennon website. WOW! You really have a way with that carving tool! I find it amazing that you just started doing this and already, you're up to carving people images. Not an easy thing to do. You did a great job and nailed John Lennon's likeness! Great work! Carving a likeness of someone is a real challenge. The slightest slip of the carving tool and you have lost the distinct 'character' that identifies a person...it is amazing how the slightess mistake will magnify when doing a carving!I am still struggling to get the likeness of Bob Dylan...it's a tough one! You should have this made into a stamp! I think you would sell a lot of them! I am so impressed! These stamps are amazing. 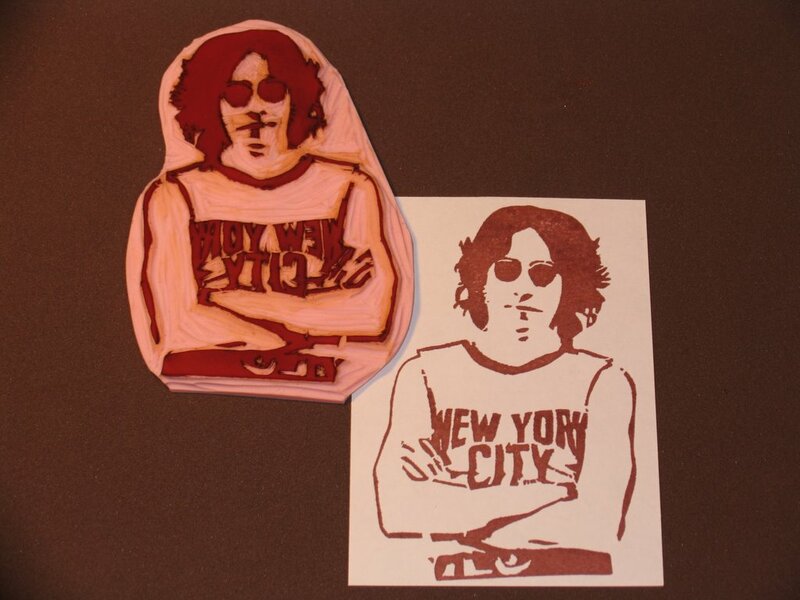 How funny that I've come across your blog today -- I'm taking a stamp carving workshop tomorrow. Serindipidy!